Hi, friends! My good friend Elyse over at Proud to be Primary and myself have decided to host a new linky called “Teacher Talk!” Each month, we will be sharing our teacher tips and tricks on different subjects related to the classroom. 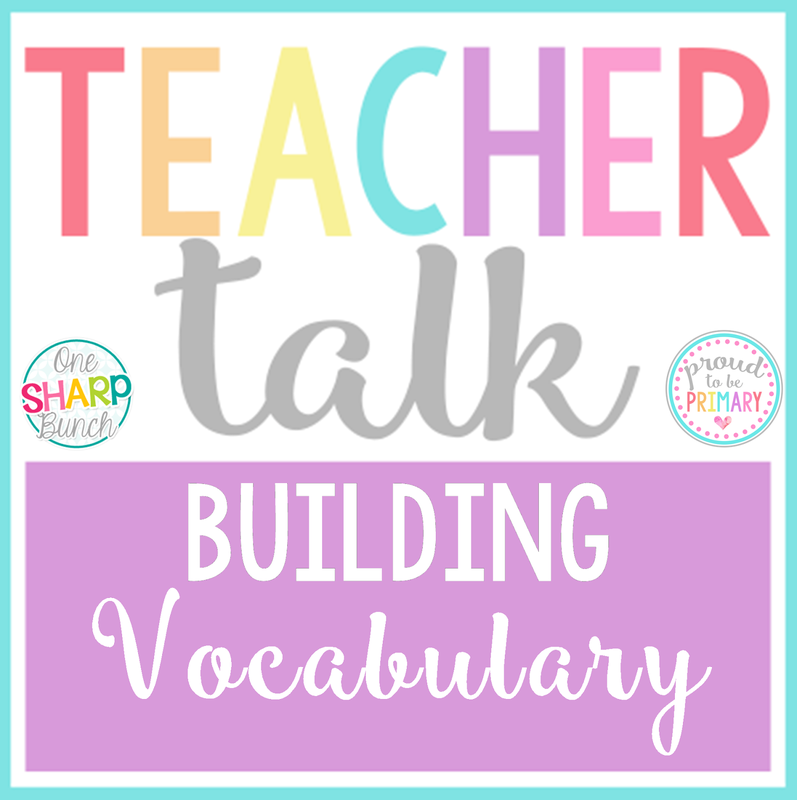 Today, we are sharing effective ways to help build student vocabulary. One of my goals this year is to try to be better at teaching thematically. Recently, I’ve felt as though my day has been so compartmentalized. I’m sure many of you can relate! It feels a little like this… okay, now it is reading time, now it is writing time, now it is math time, and so on. I’ve always made sure that my weekly math and literacy tubs, as well as read alouds for the week, are based upon a particular theme. I’ve found that working with a particular theme throughout the week (and sometimes two weeks) really helps my kiddos retain information so much better. One of the most important reasons I like teaching thematically is to help build vocabulary. These pumpkin themed read alouds lend themselves perfectly to creating a life cycle of a pumpkin anchor chart. In fact, a good majority of anchor charts introduce new vocabulary to our students. I created this anchor chart while reading the story Pumpkin, Pumpkin. I also whipped up this pumpkin diagram anchor chart while reading It’s Pumpkin Time! It’s nothing fancy, but it helped us learn a few more pumpkin themed vocabulary words! After listening to From Seed to Pumpkin, we practiced our pumpkin life cycle vocabulary a little bit more with this flap book. Poetry is another great way to incorporate vocabulary into daily instruction. Each week, we learn a new poem related to our weekly theme. During pumpkin week, we learned a rhyming poem all about the life cycle of a pumpkin. We made up hand motions for each line. Then, we practiced sequencing the picture cards for the life cycle of a pumpkin. Emergent readers also help to incorporate thematic vocabulary. This little reader highlights all of the important terminology for the life cycle of a pumpkin. Plus, it also focuses on a few of our word wall words. Now, that’s what I call intentional planning! We also use our monthly vocabulary word wall and word rings to help make these abstract words a little more concrete. Then, we use the word cards to jot the vocabulary words down into our thematic dictionaries. Adding vocabulary words to themed craftivties is the perfect way to help deepen students’ understanding of each word. Teaching thematically has helped me introduce a multitude of new words. By encountering these words in meaningful ways throughout the week, my kiddos are better able to make connections and retain important information. Vocabulary development is one of the most important steps to making meaning of the content. Being immersed in language is key! Plus, you can find more engaging activities for pumpkins on my “Pumpkins” board on Pinterest. Follow One Sharp Bunch’s board Pumpkins on Pinterest. If you have ideas and a blog post you’d like to share about building student vocabulary, feel free to link up below! **This is an open linky to anyone who wants to link up and share their ideas and thoughts about the topic. We only ask that you share the Teacher Talk image above within your post, that you link the image to one of our posts directly, and that you link up at the bottom with your own post. ***We would like this to be content rich, so please make sure to share your ideas primarily and if you have a freebie or product that is relevant feel free to share that as well, but only if they support the content. We can’t wait to read your ideas! Great post, Ashley! I love teaching themes and it lends itself so well to teaching and reviewing new vocabulary.